Hobbies: Playing pranks, Eating Ramen. 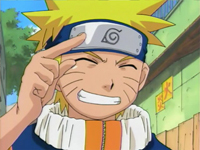 Naruto is the little man with a big dream. He becomes friends with his teammates Sasuke and Sakura, but to his villagers, he is only known as the mischief with the demon fox living inside his belly. All through Naruto’s life, he was neglected and treated like an outsider. That is why his dream is to become the hokage of Konoha-gakure, and be acknowledge by all those people that disregarded him. One thing that the other genin do know, is that he will never give up until he obtains his dream. Read Full Biography of Naruto..
Sasuke lives for one reason only, to avenge his families death. Sasuke is very popular with the girls, and has a “don’t annoy me” type of attitude, perfect for being a main character. He is the top graduate of his year, and one of the top genin of that generation. 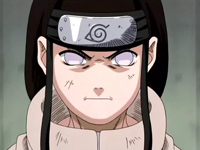 He is very good with his many fire jutsu and his very powerful bloodline doujutsu, sharingan. 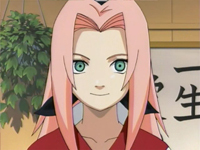 Read Full Biography of Sasuke..
Read Full Biography of Sakura.. He is the Jounin, elite ninja, of Naruto, Sasuke, and Sakura. It is said that he is the hardest teacher of all the jounin. He has a split personality, and he is ALWAYS late, but, there is something very special about him. All over the country, he is known as “The Copy Ninja Kakashi” and for a good reason too. His sharingan allows him to copy his opponents techniques. His only original technique is an assassinating technique he calls “Viking” which will later be named “chidori” or “A thousand chirping birds” because as soon as he draws out his chakra, this technique has the unique sound as the name describes. 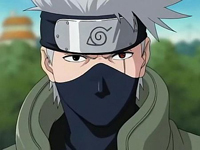 Read Full Biography of Kakashi..
Read Full Biography of Neji..
Temari is the daughter of the Fourth Kazekage, as well as being teammate and sister to Gaara and Kankuro. 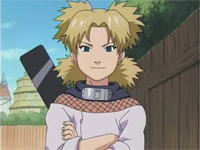 She carries a giant, Tessen (iron fan) on her back, which she uses as a powerful ninja tool; she specializes in long-range combat, and has demonstrated herself to be a keen analyst (although not of the same caliber as Nara Shikamaru). Read Full Biography of Temari..